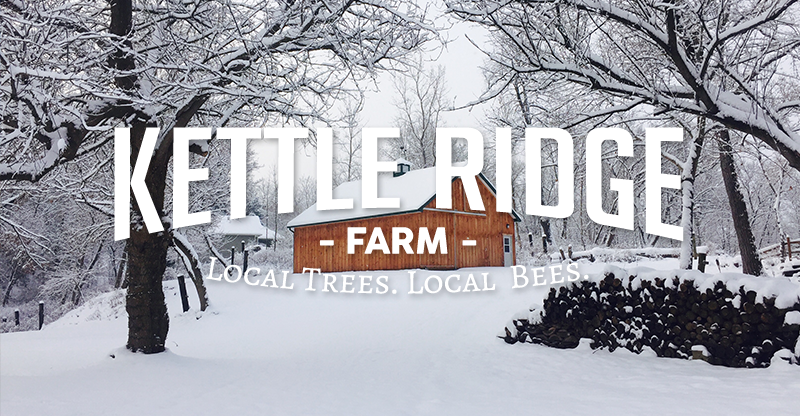 We’d like to wish everyone a very happy and healthy 2018 and say thank you to all our volunteers, customers, visitors, and other supporters for helping us have a successful 2017 here at Kettle Ridge Farm. We launched several new initiatives during this past year—e.g. 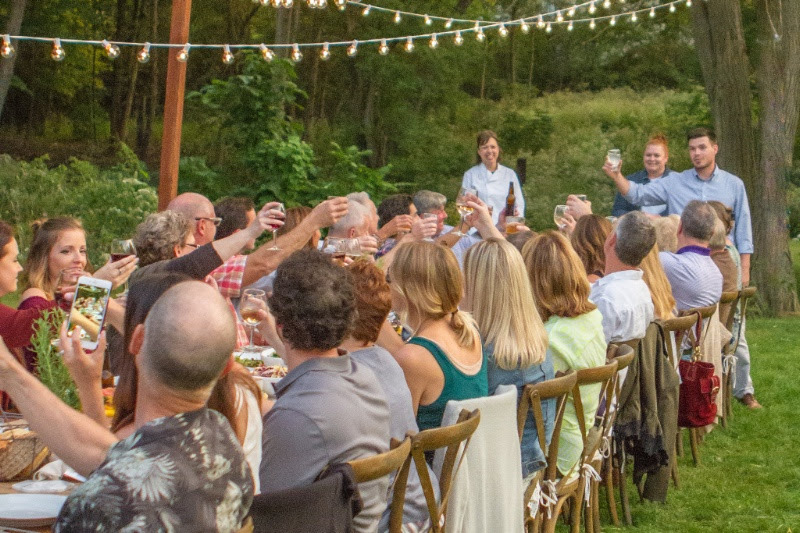 pancake food truck, Honey Dipper Festival, Dinner Under the Moon—and we look forward to offering even more new products and events in the future. Please continue to spread the word about our efforts to create a small, sustainable farming enterprise here in Victor NY, and let us know your own ideas and suggestions. How Do Honey Bees Survive The Winter? 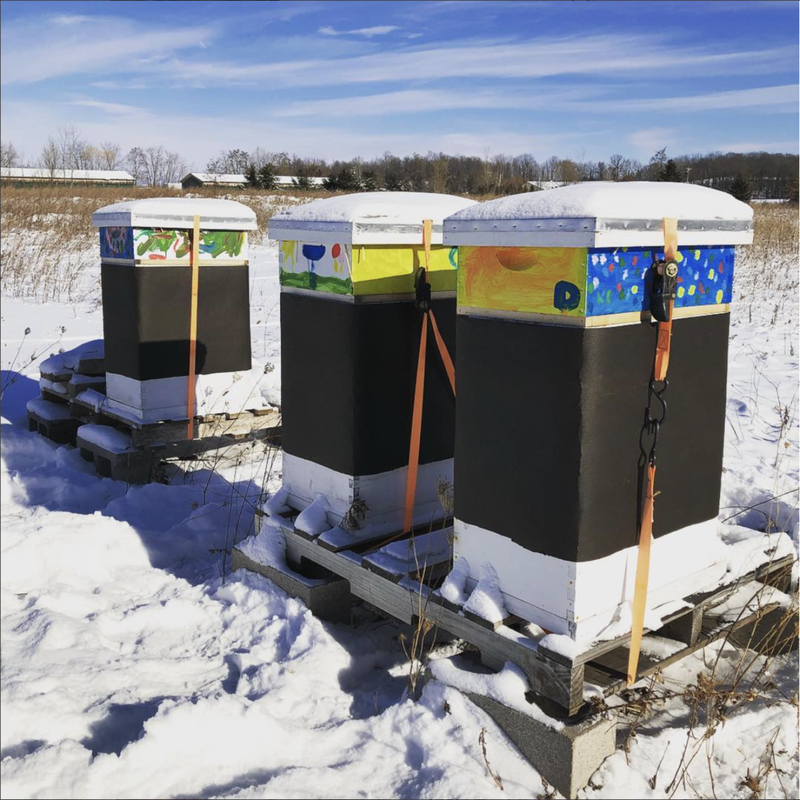 Our upstate New York winters can be hard on honey bees, especially when temperatures drop to zero degrees or below for an extended period (like the past few weeks). Bees do their best to stay warm. Like commuters on a New York City subway car in February, the occupants of a beehive will squeeze together and shiver. If successful, coordinated shivering will maintain the temperature of the cluster’s interior—where the queen bee can be found—at 60-65 degrees. As the sunlight hours lengthen in February, the queen bee is programmed to begin laying eggs for the next generation of bees. Incredibly, the worker bees will raise the temperature of the hive to 90 degrees, even on the coldest days. But things don’t always work out for the bees. If the temps get too low, and there are not enough bees to keep the hive warm, they will freeze to death. If the temps stay low for too long, and the bees are not able to get outdoors to relieve themselves, they will get sick and die. If the bees run out of the food (i.e. honey) required to fuel their heat-generating shivers, they will starve to death. A populous and healthy bee colony, with sufficient honey stores and a few winter days that warm up to the 40s or 50s, should have little problem surviving the winter. 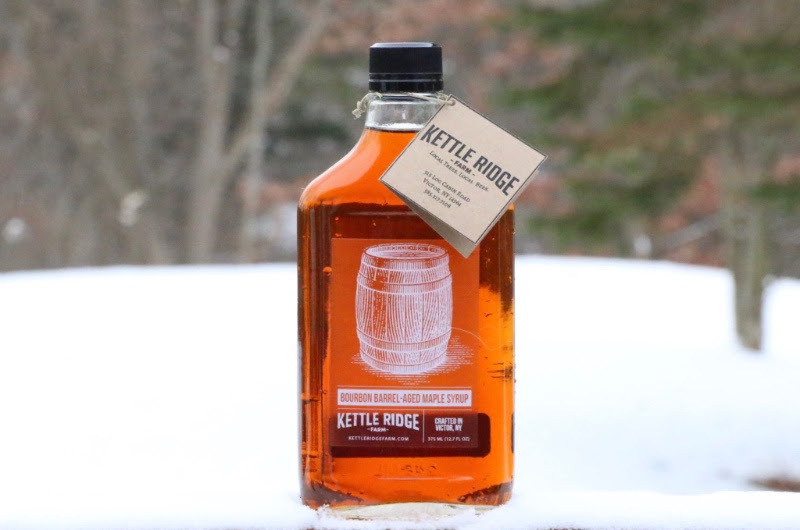 At Kettle Ridge Farm, we have had years with 100% survival and years with 30% survival. Let’s hope for the best in 2018! Adopt-a-Maple Sundays begin this Sunday, January 14. Individuals, families, and other groups will be coming out to tap their trees, take a tour, and have a pancake breakfast in our barn. It’s the cure for cabin fever! If you have registered for Adopt-a- Maple PLUS but have not yet scheduled your trip to Kettle Ridge Farm, please do so as soon as possible. You have the next 8 Sundays to choose from. We still have maple trees available for adoption. 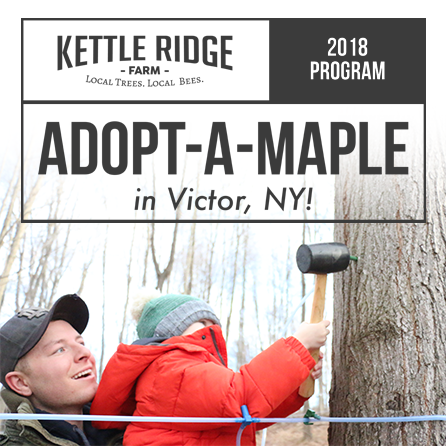 Adopt-a-Maple PLUS, which includes tapping your own named tree, a tour, tasting, pancake breakfast for 2, maple product package, and KettleFest tickets, goes for only $100. The basic Adopt-a-Maple, which includes your named tree and our package of maple products, costs $65. And here’s a little-known secret about Adopt-a-Maple Sundays: you don’t have to be tapping a tree to enjoy a delicious hot pancake breakfast or visit the tasting room. Anyone can come out with friends and family to purchase pancakes and maple syrup. Reservations are not required but it helps to let us know ahead of time. Please text 585-217-7108 or email chris@kettleridgefarm.com. Hours are 9AM to 1PM—a great way to spend your Sunday morning! Try a sample in our tasting room and you will likely be blown away by the taste of our bourbon-barrel aged maple syrup. We cracked open our first barrel last month—after seven months of aging—with great anticipation. The wait was definitely worth it! You get the great (but subtle) taste of bourbon without the alcohol. It makes a great host/hostess gift. We have a very limited supply of this product and it is selling fast, so act fast if you want a bottle or two.